I see soft goods girth hitched to other soft goods in anchors all the time. In this case a spectra/dyneema sling is girth hitched to a spectra/nylon mix runner on a hex. I’ve posted more than one “soft goods girth hitched to soft goods” anchor (see Girth Hitch Death Wish), so let’s discuss this knots issue. Any knot in cordage or webbing decreases its strength. These girth hitches reduce the strength of the slings to only 60 – 65% of their original strength. 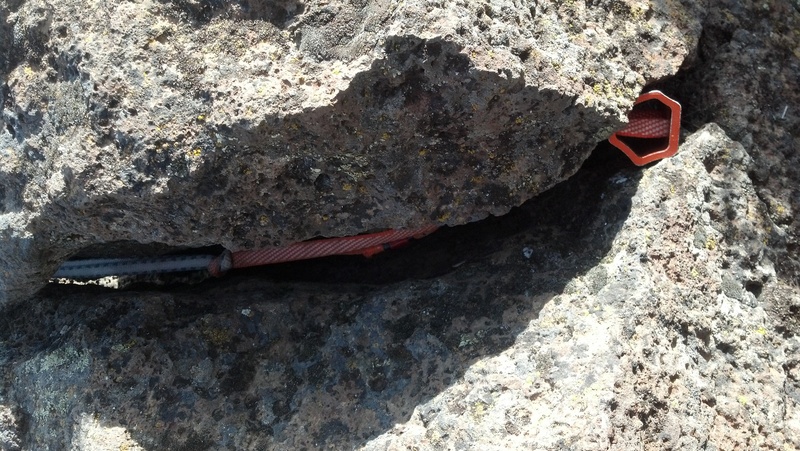 Had a carabiner been placed between the slings, there would be no knots, and the slings would still be full strength. And how about the webbing material? HMPE (High Modulus Polyethelyne) fiber, sold under the brand names Spectra and Dyneema, is stronger than steel, light weight, and offers minimal elongation (i.e., it doesn’t stretch far before breaking). It also has a relatively low melting point: 147°C. That’s not a lot hotter than the temperature of boiling water. Friction, at enough pressure and speed, can generate enough heat to melt this fiber. An example of this pressure and speed would be if, for example, you girth hitched a Spectra runner to another Spectra runner and then had a climber fall on it. Those girth hitches would immediately tighten very tight, a great pressure and speed, and…well you get the idea. This isn’t just ‘theory’. There are examples from the field of Spectra slings melting and failing at knot points in this way, so it’s just not a good practice to tie Spectra webbing together like this. If you care to geek out, here’s some testing from Black Diamond and the folks at Caves.org, and here’s a recent article on the pros and cons of Spectra v. Nylon from Rock and Ice. Finally, Here’s an interesting video testing knotted Dyneema from DMM. They don’t test slings girth hitched together, but the basic idea from the results are instructive just the same. Update: Todd Eddie offers the following link to tests from Black Diamond testing just what we’re addressing: webbing girth hitched to webbing. 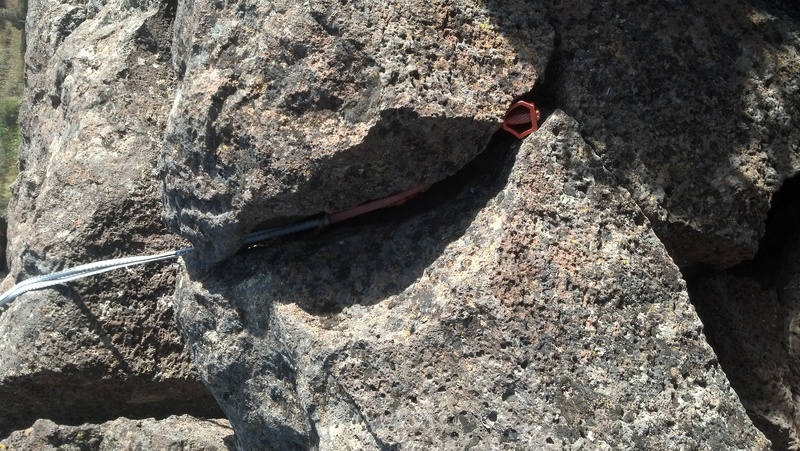 This entry was posted in Rock Anchors, Trad Pro Anchors and tagged Equipment, girth hitch, knots, Oregon, Rock, Smith Rock State Park, Spectra, webbing on April 30, 2013 by Steve.